Durham, North Carolina (June 25, 2017) – Durham, North Carolina (June 25, 2017) – The Final Pilot Report for application of the Algal Turf Scrubber® (ATS™) in the Falls Lake watershed was submitted to the City of Durham, North Carolina. Falls Lake is a primary source of drinking water for Durham, Raleigh and surrounding cities. The Falls Lake Algal Turf Scrubber® (ATS™) pilot unit was implemented to determine the suitability of applying this technology for nitrogen and phosphorus load reduction through direct treatment of Falls Lake waters, and provide performance projections for nitrogen and phosphorus load reductions and biomass management for larger scale systems referenced in the 2013 Algal Turf Scrubber® Feasibility Study. 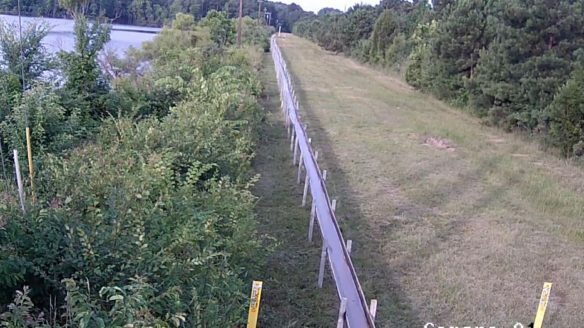 The selected ATS™ pilot facility location at the southwest corner of the Falls Lake I-85 overpass provided a suitable cleared site with access and power availability. For CY2016 total nitrogen was reduced from 1.10 mg/L to 0.97 mg/L – a 12% reduction. The nitrogen areal removal rate for the CY2016 Monitoring Period was 80 g/m2-yr; and 170 g/m2-yr for the CY2016 warm season – a 23% reduction. For CY2016 total phosphorus was reduced from 0.056 mg/L to 0.038 mg/L – a 32% reduction. The phosphorus areal removal rate for the CY2016 Monitoring Period was 14 g/m2-yr; and 17 g/m2-yr for the CY2016 warm season – a 40% reduction. These rates were achieved even though influent nutrient concentrations were lower than projected as 2014 through 2016 was the wettest recorded 3-year period in the past 70 years for the NOAA Raleigh/Durham monitoring station. Performance at these lower concentrations is important as any treatment approach selected will need to provide cost effective treatment in the future as Best Management Practices throughout the watershed reduce nutrient concentrations. Based on CY2016 ATS™ Pilot performance, for 10 and 25 MGD facilities, projected nitrogen load reductions range from 2,856 lbs/yr to 7,140 lbs/yr, while phosphorus projected load reductions range from 504 lbs/yr to 1,260 lbs/yr as shown below. Figure ES-3. Comparison of annual nitrogen load reductions projections by full-scale 10 MGD and 25 MGD ATS™ Facilities. Figure ES-4. Comparison of annual phosphorus load reductions projections by full-scale 10 MGD and 25 MGD ATS™ Facilities. Based on CY2016 ATS™ Pilot performance and cost information for 10 and 25 MGD facilities, nitrogen projected 20-Year PWC range from $67/lb to $100/lb, while phosphorus projected 20-Year PWC range from $381/lb to $565/lb. Using the calibrated Algal Turf Scrubber® Design Model, 20-year PWC for nitrogen and phosphorus removal for low rainfall periods are available within the report.